A personal interview and thorough physical examination are carried out at the beginning of each fitting for a custom leg orthosis. Our aim is to help you restore a gait pattern which is as safe and as natural as possible. 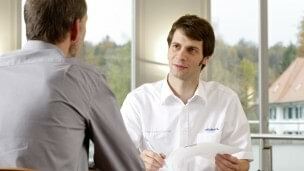 That is why before your fitting process starts you will have a personal interview with your orthotist. Here we want to understand your needs and wishes regarding your leg orthosis and determine the cause of dysfunction. In addition, it is also done to inform you about what to expect during the fitting process. Furthermore, this time is dedicated for you to ask any question that seems relevant. Our advice is to take notes beforehand so you do not forget anything important. Nevertheless, you are still able to ask questions later on in the fitting process. When you feel comfortable with your orthotist a physical examination is done which is essential when it comes to the perfect fit of your custom leg orthosis. Inspection, palpation and functionality test deliver crucial information for the construction of your final orthosis. During the inspection your orthotist at the Southern Prosthetics and Orthotics Centre examines and observes your overall posture while standing (assuming you can stand or are fitted with an old orthosis). The focus during palpation is laid on prominent bone structures as well as other sensitive areas such as wound and scar tissue which your orthotist must keep in mind during the design of your orthosis. Lastly, a functionality test is conducted in order to examine your residual muscle function. There you will be asked to perform different movements with your affected leg – as far as possible – while your muscle function and strength is being observed. This forms then the basis which leg orthosis type is most appropriate for you. We know that having a dysfunctional leg is a major challenge in your life. However, you do not have to carry this burden alone. Your treatment team consisting of your doctor, your orthotist and your therapist supports you in case of occurring problems and answers all your questions. Do not feel ashamed to talk about your fears and worries – your treatment team is skilled to handle this situation and also offers psychological counselling. The earlier you seek support, the better, since overcoming mental conflicts and fears contribute to a rapid rehabilitation and regaining your quality of life. Throughout our long history we experienced a positive impact resulting from dialogues between users. Talking to people who suffered from e.g. Polio, stroke or traumata lets you get new insights on how they deal with the situation. Moreover, you can get valuable advice on how to live with an orthosis, the fitting process and how others handle their everyday lives. Your doctor, therapist and orthotist help you to get in contact with local peer support groups. Therapeutic measures follow with the purpose of preparing you for your orthotic fitting. The muscular training functions as a preparation for you to wear a leg orthosis and is a critical step towards regaining your mobility. Your team consisting of your orthotist, doctor and therapist creates a tailor-made therapy programme for you. The training consists mainly of exercises to strengthen your torso, arm and leg muscles as well as stretching exercises. The affected side should also be included in the training. This is done by your therapist moving your affected leg manually in order to activate it. It is also important to avoid contractions of your affected side for you to gain the utmost freedom of movement. For a successful fitting your active participation is crucial. Your therapist will show you the exact exercises to optimally prepare you for your custom leg orthosis fitting. This is where you learn which orthosis is most suitable for you and which personal objectives should be pursued. The decisive factor that influences the selection of a suitable fitting solution is your residual muscle function. Depending on this information and your personal needs and wishes you and your orthotist at the Southern Prosthetics and Orthotics Centre establish which function your custom leg orthosis needs to fulfil. The secret of a good fitting solution is to handle each case individually and to supplement your available muscle strength in the most efficient way. Our goal is to provide you with an orthosis that offers the largest possible degree of freedom and functionality, optimal gait pattern and correct loading. Once the appropriate leg orthosis type is chosen for your individual case it is time to choose the right material and design. Materials such as thermoplastics or resin in combination with carbon reinforcement are most common. Pure preimpregnated carbon which is used in the aircraft industry is also available for the production of custom leg orthoses. We always strive to use as little material as necessary, while maintaining the ideal balance between highest strength and lowest weight of your final leg orthosis. The orthotist takes your individual body measurements. For us at Southern Prosthetics and Orthotics, regaining your mobility means that your orthosis fully supports you in each of your daily activities. Detailed measurements are important so that your orthosis fits you perfectly and you feel safe during each phase of the movement. The exact shaping of your orthosis is extremely important in this respect, just like a shoe: if it isn’t a good fit you can’t walk properly. In our Southern Prosthetics and Orthotics Centres we use both digital methods and plaster cast, depending on the condition of your leg to ensure precise measurements. Fabrication of a custom orthotic solution follows. Using your measurements, your orthotist produces a one-to-one model of your leg. This then serves for manufacturing your custom-made orthosis. You can rest assured that, without exception, the materials used in our leg orthosis are technically advanced, comprising thermoplastics, resin and lightweight carbon fibre to support you reliably. During the fitting, the orthotist adapts the orthosis to your individual needs. Your orthotist at the Southern Prosthetics and Orthotics Centre will first manufacture a test version of your custom leg orthosis to guarantee a perfect fit of your final solution. You can use the test orthosis for gait training with the therapist. Together with your orthotist you will answer essential questions according to the fitting: Does the orthosis correct your posture? Does it offer the functions need? Does it fit you well? Please keep in mind that your test orthosis is only a temporary tool and its appearance cannot be compared with the elegant design of your final orthosis. The test orthosis consists of thermoplast which allows your orthotist to adjust it directly on the spot according to your specific needs. Thus we make sure that you get exactly the final leg orthosis that supports you in the most useful way. You may need to visit the Southern Prosthetics and Orthotics Centre several times to ensure that the fit of your new orthosis is correct. Please be patient at this stage of the process – it pays off well in the end. Once the evaluation of your test orthosis is satisfactory, your orthotist manufactures the final device. Modern materials, individual finish and look, thorough examination and testing – your final leg orthosis is a result of a variety of factors being considered. We also pay special attention to functional designs, such as different shapes in which the orthoses are cut, padding materials and closure systems. A comfortable fit, natural appearance, low weight and less heat build-up on the skin are just some of the factors to consider during this phase. Fine tuning your individual leg orthosis to meet your needs can be achieved by adjusting the hardness of the material or changing the degree of freedom of your mechanical ankle joint. Here you learn how to correctly handle your orthosis in daily life. The purpose of your rehabilitation is for you to train using your custom leg orthosis aiming at providing you with maximum mobility and independence. Therefore, your therapist assembles an individual rehabilitation programme. For you to reach your ultimate goal without overstraining yourself the level of difficulty of the exercises gradually increases over time. The starting point of your rehabilitation training depends on the condition of your leg. You can directly influence the success of your rehabilitation through active participation as well as high levels of motivation and self-confidence. Your affected side requires special care and attention. In order to prevent infections you should pay special attention to folds of your skin and scar contractions. Look out for skin injuries, pressure points and blisters which require medical treatment. To see the back side of your leg more comfortably you can make use of a mirror. Your therapist will help you learn how to use your orthosis properly. This includes standing up and sitting down, locking and releasing the joint system as well as putting the orthosis on and taking it off, which is an important everyday task. Your family or friends may need to help you initially, but the aim is for you to ultimately do this on your own. Over time you'll learn more about how to use your orthosis and will be able to perform more complex exercises. Gait training focuses on coordination exercises, the strengthening of your pelvis and upper body muscles as well as weight bearing exercises. The exercise programme is individually designed and takes your needs as well as your orthotic fitting into consideration. Gait training begins once you feel comfortable and confident in handling your orthosis. You can positively influence the gait training by strengthening your muscles for a stable body posture in advance. During the training process you will first learn how to walk between parallel bars. Your walking aids will then gradually be reduced with the ultimate goal for you to walk independently. You are supported in making this transition by learning to use correct walking techniques. Depending on your orthotic fitting you will also learn how to employ special techniques that enable you to walk on ramps and stairs. Together with the rehabilitation team you discuss to which extent you can cope with the orthosis. After the successful fitting, adjustment period and rehabilitation, you'll be ready to master the challenges of daily life in social and professional settings. A multidisciplinary team composed of our therapist, orthotist and, ideally, your own doctor will make the final approval of your custom leg orthosis. By now you'll have already gained some initial experience with your new orthosis and decided whether it meets your needs and expectations. Finally, our special Dartfish video software analyses your gait pattern and shows the progress you made during your treatment at Southern Prosthetics and Orthotics Centre. Before you leave Southern Prosthetics and Orthotics, your orthotist will present you with a treatment outcome report for your documentation and a manual containing all the important information you need concerning the use of your leg orthosis. Ottobock regards itself as a long-term partner for you to master the challenges that you decide to tackle. 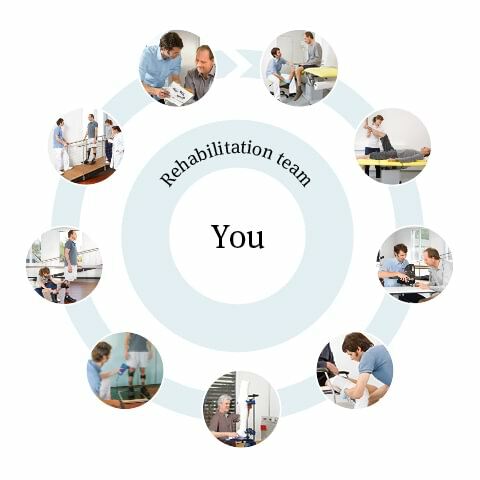 This is why, even after your successful fitting, adjustment period and rehabilitation your local Ottobock Compentence Centre still remains in contact with you. We recommend you to visit us for regular check-ups so we can determine if adjustments need to be made and can implement these. Please feel free to get in touch with us in case you have questions or queries of any kind.